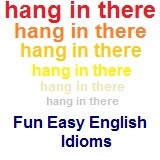 ﻿ Fun Easy English - new american english idioms letter l.
In this lesson you will learn American English idioms beginning with the letter L. You will learn the definition and study the usage of each idiom. LABOR OF LOVE something done out of affection or great interest 1. Martha loves to knit sweaters for her children. She could buy them for less money than it costs her to make them, but they are a labor of love for her. 2. When Ralph built a wagon for his son, he picked out the wood himself, carefully sanded each piece, and hand painted it with more coats of paint than necessary. Building the wagon was a labor of love because it was for his son. lady killer man who some women find very charming and attractive The man in the movie was a lady killer. lady's man man who is popular with women He is a lady's man and always seems to have a lot of women interested in him. laid back calm and relaxed You need to be more laid back. laid up confined to bed He has been laid up for a few days because of a cold. The expression suggests that a lame duck—a duck that cannot fly—is ineffectual. It originally comes from the 1760s London Stock Market, where it referred to investors who were unable to pay their debts. 1. After an election, a lame duck congress often gets a lot of serious work done because the members who have been voted out are no longer running for office and no longer have to worry about pleasing their constituents. 2. The board of directors chose a new chairman to take over running the company. The old chairman had a few weeks left before he had to step aside, but his workers no longer feared him because he was a lame duck. land on one's feet come out of a bad situation successfully He always manages to land on his feet. The lap of luxury means a very comfortable life because one is rich, whereas the life of Riley is an easygoing life because one doesn’t have to work or isn’t working. Someone who is poor can lead the life of Riley if he or she doesn’t mind being poor. 1. Because she was the richest movie star in the business, she had a magnificent house, servants, cars and clothes. She was living in the lap of luxury. 2. If this business deal succeeds, we’ll never have to worry about money again. We’ll be living in the lap of luxury. lap up drink with his tongue The dog began to lap up the milk that was given to him. lap up take in eagerly He could lap up the praise that his boss gave him. lash out verbally abuse He began to lash out at the man who was sitting next to him. The expression is used before the last in a series of items to indicate that it is not less important for being last. Usually the series has been randomly arranged and no specific order of importance has been assigned to the items. 1. If you want to borrow my car, you have to follow the rules. First, you must obey the speed limit, fill up the gas tank before you bring it back, and bring it back before I need it tomorrow. Last but not least, you may not drive it if you have been drinking alcohol. 2. John accomplished a lot in his lifetime. He was a teacher and an activist for the poor, he wrote several books, and last but not least, he raised four successful children. a very strenuous final attempt. 2. Ronnie slipped and fell as he ran to catch the baseball, but when he looked up, the ball was still sailing through the air. Ronnie got up and made a last ditch effort to catch the ball. last minute there is no more time I usually put off writing my papers until the last minute. Both expressions suggest the idea of loading straw (a relatively light material) onto a camel’s back until one final light straw (the last straw) breaks the camel’s back. 1. Constance finally quit her job because the boss asked her to make the coffee and act as a hostess, even though she was hired as an accountant. The last straw came when the boss asked her to go out and buy his family’s Christmas presents and then complained because she couldn’t get her work done. 2. First the builder dropped paint on their new carpet, then he backed his ladder through their window. When he backed his truck over their prized flowerbed, it was the final straw, and they told him not to come back. The expression suggests that the person who triumphs enjoys laughing at those who doubted him while he takes the fruits of his success (money) to the bank. He will be the rich one. 1. No one wanted to invest in Paul’s scheme to make money, because they thought it sounded crazy. When it worked, he laughed all the way to the bank. 2. People think Mrs. Walker is silly to save money now for her retirement, but she’ll laugh all the way to the bank when she has a comfortable lifestyle later. Whereas bomb is usually applied to creative activities (e.g., a play, a book, a movie, an idea) that fail on a grand scale, lay an egg is usually applied to something that is socially embarrassing on a small scale. 1. I really laid an egg when I asked that elderly woman how old she was. I was just curious, but I should have known it was the wrong thing to do. 2. Everyone stopped talking and looked at the young man in disbelief when he asked Mr. Thomas about his salary. The young man had really laid an egg. Read (someone) the riot act implies more noisy anger against a past action than lay down the law, which implies stern instruction governing future behavior. 1. The boss had noticed that the employees frequently took more time than they were allowed for lunch and coffee breaks. The boss knew he had to put a stop to it, so he called a meeting and laid down the law. 2. The teacher decided that he would no longer tolerate late homework, coming late to class, or chatting during class. When the students were all in their seats, he laid down the law. The expression originates from the idea of a card game in which one must reveal one’s cards by laying them on the table. 1. They didn’t understand what Mr. Palmer’s plan would lead to or why he was trying to involve them, so finally they asked him to lay his cards on the table. 2. When the boss had been strangely quiet for several weeks, the workers knew that something must have been going on. One day she called a meeting and told them that now she could lay her cards on the table. LEAD (SOMEONE) AROUND BY THE NOSE to dominate someone; to force someone to do something 1. The department chairman runs the department, and no one else has any say in how things are done. He leads everyone by the nose. 2. The students seem to be in control of what’s going on in the classroom. They lead the teacher around by the nose. These expressions are similar, but take place at different times. Before one knows the ropes, one learns the ropes. 1. The bank manager told the new trainee to keep his eyes open and watch what the other tellers did until he learned the ropes. 2. I’m willing to work long hours and I’ll work for free. I’m anxious to learn the ropes of this business. The expression suggests that whatever one is searching for might be under a stone, and that one will search so thoroughly as to turn over every stone looking for it. 1. The boss called the employees together for a meeting. He said he didn’t know who was stealing from the company, but that he would leave no stone unturned until he found out who it was. 2. The police looked everywhere for the prisoner who had escaped. They left no stone unturned, but they were unable to find him. Synonym: leave (someone) high and dry 1. The builder hired several carpenters and electricians to work on the building, but he left them in the lurch when it came time to pay them. 2. The company went bankrupt and the stockholders got left in the lurch. They had to pay all the outstanding bills. 3. Where were you at four o’clock? I thought you were going to attend the meeting and help us with the difficult decisions that needed to be made. You shouldn’t have left us in the lurch like that. The expression suggests that when a person is excluded from the group or mainstream, he or she is outside, where it is cold. 1. Mary seemed not to care for anyone else’s feelings, and managed to offend just about everyone. Eventually she got left out in the cold and no one included her in their plans or parties. 2. I don’t know what I did wrong, but I’d like to make up for it. Please don’t leave me out in the cold. The expression probably originates from the idea of a ship stranded on high ground, leaving it out of water (dry). 1. Bob got a ride to the party with his friends, but they left without him and he had no way to get home. They left him high and dry. 2. When you buy a package vacation trip through a travel agency, be sure that it is a company that has a good reputation. Too many companies have gone out of business, leaving those who have already paid their money high and dry. LEAVE (SOMEONE) HOLDING THE BAG to leave somebody with unwanted responsibility 1. If I invest my money with you and things go badly, I want to make sure you’re going to take responsibility. I don’t want you to leave me holding the bag. 2. Laura took a risk and it failed, and she was left holding the bag. Similar to: leave (someone) in the lurch, leave (someone) high and dry. Synonym: let sleeping dogs lie 1. Her work isn’t perfect, but your criticism might just make the situation worse. I recommend that you leave well enough alone. 2. I’m a perfectionist, so I can never leave well enough alone. Sometimes that is okay, but sometimes it causes me nothing but trouble. Dating from at least the 1600s, this phrase has consistently meant to listen to or ask someone to listen. It became especially popular after William Shakespeare’s play Julius Caesar, in which Mark Antony says to a noisy crowd, ‘Friends, Romans, Countrymen, lend me your ears’ in order to get them to quiet down and listen. 1. The boss walked into the coffee room where we were chatting and asked us to lend him an ear. He wanted us to listen to what he had to say. 2. All the children pulled on the teacher’s skirt, begging to hear the news. She finally told them that if they gave her an ear, she would tell them what they wanted to hear. The expression is from a proverb dating back to the 13th century and suggests the threat of attack to one who frightens a dog by suddenly waking it from its sleep. 1. The situation seems to have resolved itself, and I’m not going to bring it up again. I’m going to let sleeping dogs lie. 2. The politician resigned his office before his colleagues could bring charges of misconduct against him. After that, they let sleeping dogs lie and didn’t pursue the matter. The expression is used only in reference to writing or speech. 1. The boss was always happy with Meg’s typing because it was letter perfect. 2. The actor practiced his lines over and over so that he wouldn’t make any mistakes on stage. He wanted to get his lines letter perfect. Centuries ago, merchants would sell piglets in bags. If a dishonest merchant placed a cat in the bag instead of the more costly and valuable piglet, the buyer might not know until they opened the bag and let the cat out. 1. When Rachel decided she was going to quit her job, she told her best friend but she didn’t want to let the cat out of the bag. Rachel told her friend not to tell anyone. The lap of luxury means a very comfortable life because one is rich, whereas the life of Riley is an easy-going life because one doesn’t have to work or isn’t working. Someone who is poor can lead the life of Riley if he or she doesn’t mind being poor. The expression the life of Riley seems to originate from a song that was popular in the 1880s. It was a comic song called “Is That Mr. Reilly?” written by Pat Rooney, and it described what Mr. Reilly would do if he suddenly became rich. 1. When Henry retires, he plans to live the life of Riley. He won’t have to work and he’ll be able to putter around the garden every day. 2. Mrs. Hartley lived the life of Riley until her husband died and she had to take on two jobs to support herself. The expression suggests that something has no effect in the same way that water rolls off a duck’s back, not penetrating the bird’s feathers. 1. Patricia never takes criticism personally. She accepts it and doesn’t feel hurt—it’s like water off a duck’s back. The expression suggests that the amount of food that a lion would take for itself would be the greatest portion. 1. The children ate the lion’s share of the ice cream. They left only a few spoonfuls for their parents. 2. The son inherited the lion’s share of his father’s estate when the old man died. The other relatives in the family got practically nothing. LIVE AND LET LIVE to live without interference from other; to not interfere with the lives of others. 1. They were very good neighbors because they never complained or worried about how other people looked after their houses. Their attitude was live and let live. Compare to: go whole hog; hook, line, and sinker; whole nine yards 1. When the farmer moved away, he sold his land, his farmhouse, his livestock and all his equipment. He sold everything lock, stock, and barrel. 2. The shop owner arrived at his shop one morning to find that thieves had stolen all his merchandise. They had cleaned him out lock, stock, and barrel. Compare to: bottom line; nitty gritty; make a long story short 1. I don’t have a lot of time, so please don’t go into all the details of the story. What’s the long and short of it? LONG SHOT an attempt at something that has only a small chance of being successful 1. The newspaper reporter didn’t know where the actor was staying. It was a long shot, but he guessed that it would be a hotel near the movie studio. He found the actor at the second hotel he called. 2. When they found a house that they really wanted to buy, they called the owners, but found out that they were not interested in selling. It had been a long shot, so they weren’t too disappointed. Don’t look a gift horse in the mouth is often used to tell someone that he is being overly suspicious of the giver’s motives or overly critical of the gift. The expression originates from the practice of checking the age of a horse by inspecting its teeth. If a person received a horse as a gift and then checked its teeth to see how old it was, this would be seen by the giver as greedy and ungrateful. 1. You are too suspicious of Greg’s motives. If I were you, I would accept his gift graciously. Don’t look a gift horse in the mouth. 2. Johanna said that she appreciated their thoughtfulness in giving her a new car, and that she didn’t want to look a gift horse in the mouth, but she really would prefer a model with a few more extra features like air-conditioning and a CD player. The expression suggests that one person is on a higher (social) level and must look down his nose in order to see the person or thing on the lower level. 1. The well-off people in this city look down their noses at taking public transportation. They only take taxis. 2. The girl’s parents would not let her marry the young man because he was from a lower social class. They looked down their noses at him. The expression suggests how a person would look or feel if he or she were warmed up after dying, i.e., still dead. 1. Sue looked like death warmed over when we went to see her in the hospital after her surgery. 2. I stayed up for three nights straight studying for my philosophy exam and now I feel like death warmed over. Canaries are songbirds that people keep as pets in cages. A cat that had swallowed a canary would be pleased with itself but also know that it would be in trouble when the master of the house came home and discovered what had happened. 1. The clever businessman had just completed a very profitable deal for a very good price, and he was very pleased with himself. He looked like the cat that swallowed the canary. 2. The boss used to be a pretty sloppy dresser, but now he wore stylish slacks, silk ties, nice shoes, and top- quality jackets. He really looked sharp. Synonym: lose (one’s) temper Antonym: keep one’s cool 1. When another soccer player tripped Mary and the referee didn’t notice, Mary lost her cool and shoved the other girl back. 2. I know you think Tom stole your idea, but you can’t lose your temper in this meeting. Don’t lose your cool. LOSE/HOLD (ONE’S) TEMPER to become suddenly angry. To hold one’s temper means to remain calm when irritated. Compare to: blow (one’s) stack; fly off the handle; see red; hot under the collar 1. The children’s mother was tired of asking them to pick up their toys. Finally, she lost her temper and yelled at them. lose weight become thinner I really need to lose weight this year. The expression originates from the totem poles of some tribes of Native Americans. They were wooden statues made of tree trunks, which consisted of several carved heads, one on top of the other. The expression is usually used to describe the hierarchy in a business, club or office rather than a social or family setting. Even when the expression refers to a female, the expression is still low man on the totem pole. 1. Sheila eventually wanted to become a manager, but since she had just joined the company, she would have to be low man on the totem pole for now. 2. Chris was happy when he finally got a promotion in the company. He was no longer low man on the totem pole. luck out are fortunate If you luck out in Las Vegas, you can make a lot of money. This slang expression is used between friendly equals. 1. They got to the airport late and, because there were no more economy seats left, they got to sit in first class for no extra charge. They sure were lucky dogs. 2. Carl has relatives who own a car dealership, so he always gets a good deal when he buys a new car. He’s a lucky stiff. Hey do you know any English idioms beginning with the letter L not listed on this page?